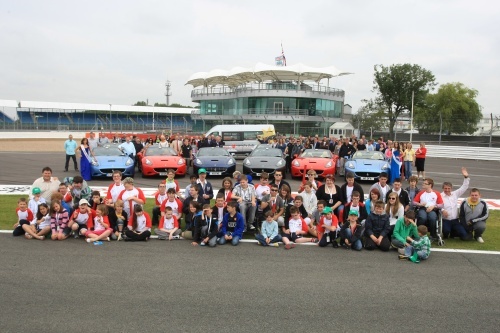 On Tuesday, 26 July 2011, 50 disabled, disadvantaged and seriously ill children, nominated by Variety Club, the Children's Charity and BEN, the automotive industry charity, each experienced the thrill of being driven around Silverstone Circuit in a fleet of Ferrari California sports cars. Their chauffeurs were some of the BRDC SuperStars along with Club Members’ Jason Plato, Tim Harvey and Nick Mason. Aged from seven upwards, the children had travelled from all over the UK to attend the Ferrari California Experience. All have displayed remarkable fortitude in the face of seemingly insurmountable obstacles. Some are battling illness; others are suffering personal bereavement but all had the chance to put their problems behind them and enjoy a truly unforgettable day.